The My First Thomas & Friends Roll and Spin Rescue Train Set invites toddlers to join their favorite characters on a fun-filled journey through playtime! This adorable toy train lets children create rescue adventures for Thomas and his friend Harold. Place Harold the helicopter on the flatbed cargo car, connect it to Thomas and the other cargo car, then push them along as a linked train. For even more play, use them as two separate rolling characters. Plus, when Harold's wheels move, his propeller spins! 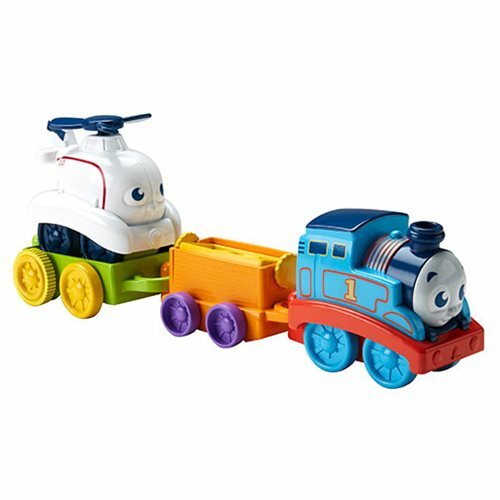 Create your own adventure with this My First Thomas & Friends Roll and Spin Rescue Train Set!